I can’t believe it’s taken me this long to review Kirin. It’s my favorite Chinese restaurant in Sonoma County, and I’ve been eating there since I was a kid. Sure, it may not be the pinnacle of authentic Chinese cuisine, but it’s delicious, consistent, and oh, the Mongolian beef. Every time I visit or order take-out from Kirin, I must order the Mongolian beef. Seriously, in my more than fifteen years of dining there, I’ve ordered the Mongolian beef every time. Every. Single. Time. Sure, I order other dishes too, but their super garlicy, oniony, spicy and slightly sweet rendition is the best I’ve ever had. I usually order soup too, and Kirin’s wor wonton soup is my favorite on the menu. The broth is savory and rich, and the meat wontons have a good kick of ginger to them. The portion size is generous too; an order of “small” is meant to feed two people but can easily fill up four bowls. During my last visit, in addition to the requisite Mongolian beef, I also ordered the simply named chicken with vegetables. 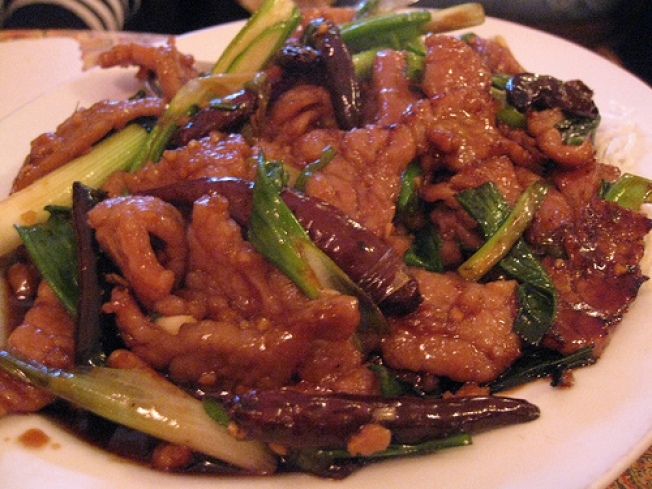 And that’s exactly what it is: stir-fried boneless chicken with seasonal vegetables, coated with a savory brown sauce. The service at Kirin can be hit or miss, though it’s always at the very least decent. Expect a wait if you arrive for dinner on a weekend as it tends to get busy. Kirin may not serve Chinese delicacies like sea cucumber and bird’s nest soup, but it’s a solid place for all the classics that you usually find on a Chinese-American menu. You know, like Mongolian beef. Did I mention the Mongolian beef?